Spread 1 tablespoon cream cheese evenly over each whole cracker. Spoon 1 teaspoon fruit spread on top. 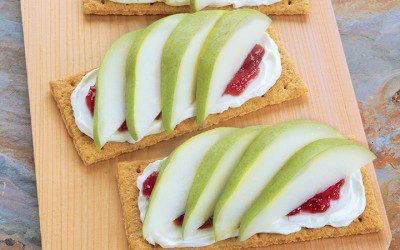 Arrange 4 pear slices overlapping slightly on top of each cracker. Serve immediately. Note: With 3 grams of protein and 2 grams of fiber per serving, this snack is a filling treat for any time of the day. Exchanges per serving: 1 Bread/Starch, 1 Fat.